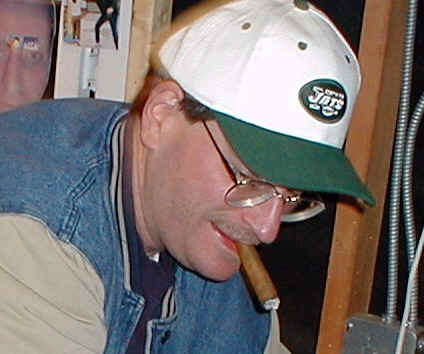 Joe entered our lives a few years back when his brother and Shed owner Frank Murphy invited him to The Shed to watch the Jet game. Moe had been taking a lot of abuse from Jet haters. (everyone). Joe held jobs in Manhattan from time to time and dealt with the corporate world, as a headhunter. Murphy's friends, formerly known as the Burnouts, were a little more blue collar. Joe couldn't believe the conditions of the Shed, or it occupants. At first he would do nothing but complain about his surroundings. In fact he always complained about his surroundings. So the boys did what they do best, go back at him. And so a love-hate relationship was born. For the years that followed a special relationship was formed between the boys and Joe. For all their complaining about each other, they couldn't wait to hang out together. When Joe wouldn't make it to the Shed, it was disappointing. the same energy level wasn't there. And Joe would always threaten to stop coming to The Shed, but every week he'd be back there, taking abuse, food, beer, liquor, etc. And complaining about it all. When a documentary was produced about The Shed, at first Joe was angry about how he was depicted. But after some time he was able to laugh at it. Eventually he was proud of the documentary, when it was screened at a party of 70 of his closest childhood friends. He was an instant celebrity. One thing is certain, The Shed will never be the same without him.